While I was on bed rest, I realized I needed an app to do calendar time with J-jo since I couldn’t move our calendar board downstairs to be by the couch where I would be all day. I commissioned my husband, who is a programmer, to create one for us. It was fun to create something together and the product was actually something I could use! The good news is that he has put it in the app store and you can use it, too! The home screen where you can choose the activities. If you start at calendar, you will be led through all the activities. The calendar. After you finish this page, a pattern of shapes is revealed on the dates as you progress through the month and the child has to choose the right shape to continue the pattern starting on day 6 or 7. My husband surprises me with his ingenuity:) He came up with a weather machine to make choosing the weather a little more entertaining. On the next screen, the weather gets recorded on a bar graph. There are two levels, a preK/K level and a 1st/2nd level. You can create multiple accounts on the app so that if you have more than one child, each can work at his level. 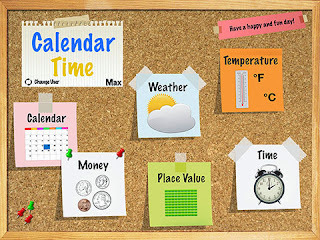 In addition to putting the date on the basic calendar, the app includes patterning, determining the weather for the day and graphing it via a bar graph, finding temperature, choosing the right amount of coins for the day of the month, looking at place value for the number of days you have used the app, and telling time. Here is a video of J-jo using the app. That looks CUTE! I envy you calendar-doing homeschoolers–I'm more like a "Get your butts to the table, already, and get to work!" kind of homeschooler. This is awesome, and oh-so-tempting to buy! If I hadn't already spent a lot of time on a calendar time area on our wall with laminated pieces I would definitely do this. 🙂 Thanks for sharing! Love this! We just purchased it, but it won't let us go beyond the Loading stage. It crashes after that. I didn't want to leave this in the review section. Our iPad is first gen, but up to date on iOS. Any ideas? Cathy, I am really sorry about it not working on the first genation iPad and realize that must be disappointing and frustrating. We have tested the app on the iPad 2 and 4 and it works fine so far on these. My husband will try to figure it out and fix the problem, But in the meantime, you can follow the instructions in the app store and get a refund! I sent you a message on WTM about your AAR 1 and I am so glad I decided to check out your blog. 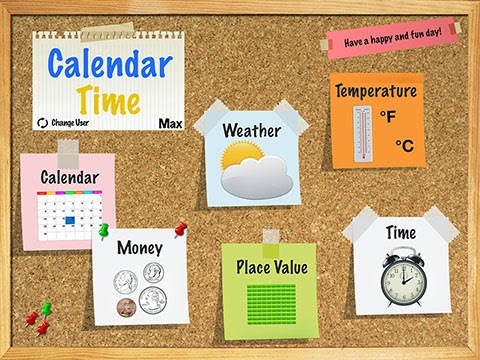 I just purchased the calendar time app. I've got a calendar notebook for my son but I have to sit with him and sometimes it's just not possible for me to do that. I love that he can learn with this without me there every second. When I read that you and your husband made an app together, I got so excited. 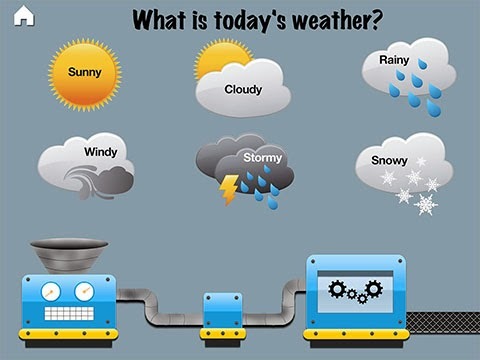 My brain went haywire and wanted to ask if you can add a bar graph to the weather portion and I noticed that you already did! 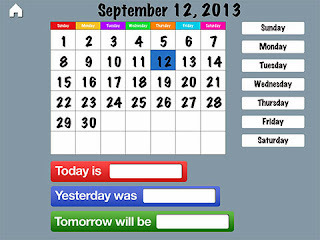 Have you thought about putting some of your Montessori activities into an app? Or even art education? Now, I have to go see if the app works on my iPad! Congrats! It would also be cute to have a dressing up a person section to coordinate with the weather and temperature. Just wanted to say how much we are enjoying your app!